← Flash! Extra! Eagle Talons Published! 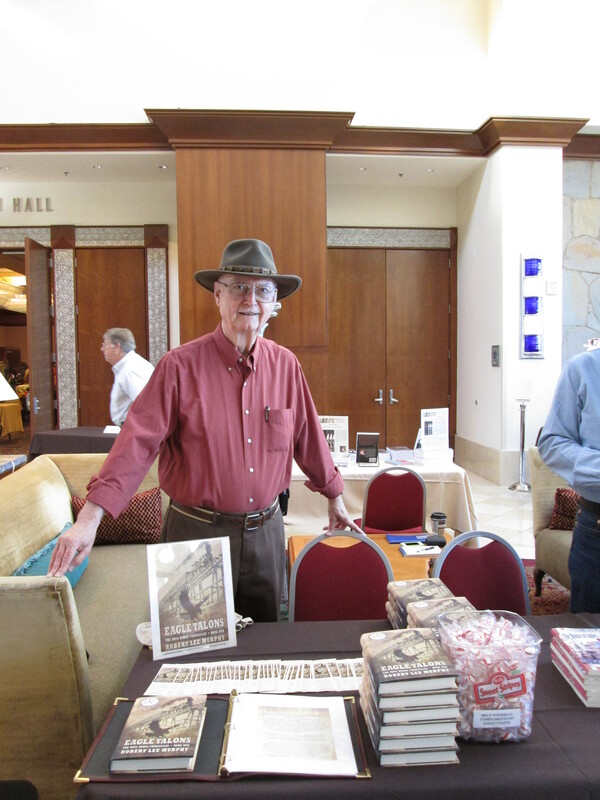 On October 25, 2014, I sold and autographed copies of the newly published Eagle Talons, The Iron Horse Chronicles–Book One, at the annual Crafts Fair in Sun City Anthem, Henderson, Nevada. Several members of Sun City Anthem Authors manned tables in the lobby of the Recreation Center to sell their books and autograph them for residents. All of the hobby and creative clubs in this retirement community take this annual opportunity to offer their handcrafts, art work, and books to their fellow residents. Here, I have copies of the hardcover book ready for sale, as well as bookmarks and candy to give away. I was quite pleased with the interest in my book, and happy that those who chose not to purchase the hardcover first edition expressed a desire to download the Kindle version. From my standpoint, it was a successful event. The fair ran from 9 am until 2 pm, providing plenty of time for the residents of Sun City Anthem to browse the dozens of tables offering crafts and wares from which they could make selections that might wind up as Christmas gifts this year. This entry was posted in Eagle Talons - Book One, The Iron Horse Chronicles and tagged Adventure Fiction, Eagle Talons, Five Star Publishing, Frontier Fiction, Historical Fiction, Teen Fiction, The Iron Horse Chronicles, Western Fiction, Young Adult Fiction, Young Readers. Bookmark the permalink.